Aston Martin Vanquish (AM310). 2012 to date (prod. unknown). 2-door coupé. F/R, 5935 cm³ (V12 DOHC). 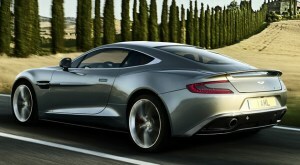 Aston takes cues from exclusive One-77 for regular flagship, looking close to the AM310 concept. All-new grand tourer has substantially revised six-litre V12, developing 573 PS and 620 Nm, with styling cues from One-77. More boot space than predecessor. Touchtronic 2 six-speed automatic gearbox. Top speed at 183 mph.